The retreat has prompted howls of outrage, from politicians who wanted Britain to stay in the EU as well as some Leave voters who say they feel "cheated." The official Vote Leave campaign claimed that membership in the EU cost the U.K. £350 million a week, "enough to build a brand new, fully staffed ... hospital every week." The slogan was painted on the side of the campaign's bright red bus. Pro-Brexit politicians continued to make the claim, despite being repeatedly admonished by the independent statistics watchdog for misleading voters. 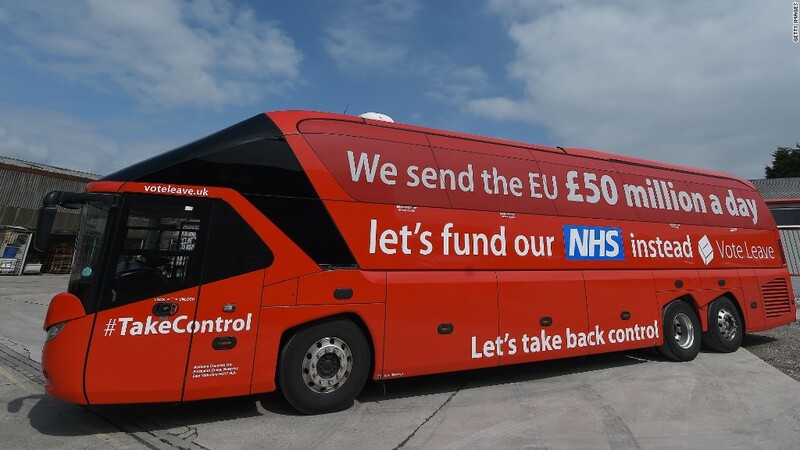 Iain Duncan Smith, a leading figure in Vote Leave, told the BBC that the campaign didn't say "all" of it would go to the NHS but "a significant amount of it" would. Related: Brexit hangover: 3 huge headaches facing the U.K.
Nigel Farage, leader of the U.K. Independence Party and who campaigned for Brexit said implying that money sent to the EU could be spent on the health service in the future was a mistake. "No I can't [guarantee it], and I would never have made that claim. That was one of the mistakes that I think the Leave campaign made," he said on British TV after the vote. About half of the money Britain hands over to the EU is returned to the country via subsidies for farmers, grants for research and funding for infrastructure. And that money is already committed. Brexiteers told Britain's farmers and poor regions such as Cornwall that they wouldn't lose out financially once those funds are cut off. They made similar commitments to support U.K. universities and scientists -- the second biggest beneficiaries of research grants from the EU. Cornwall, in southwest England, voted in favor of leaving the EU. Local officials are already seeking confirmation from the government that the county won't be worse off as a result. During the campaign, Brexiteers attacked the U.K. government for missing its target to cut net migration to tens of thousands (it was 333,000 last year), saying that only by leaving the EU could Britain control immigration. Many voters say they backed Brexit because they expected immigration to fall. Leave campaigner and lawmaker Nigel Evans told BBC radio that there had been "some misunderstanding" over the Leave campaign's position on reducing immigration. When asked if the number of people coming into the country would fall significantly, Evans said that a new Australian-style points system for EU migrants meant the U.K. would be able to control immigration -- but he didn't say it would fall. Brexit voters have another problem: Negotiations on the terms of Britain's exit haven't even begun. The U.K. may have to keep its borders open to EU workers if it wants to trade freely with the rest of Europe -- a view articulated on Friday by Daniel Hannan, another leading voice in the Leave campaign. "Don't care what you said Mr Hannan. We just voted to stop mass immigration. Now deliver for us," tweeted Vote Leave Derbyshire. @DanHannanMEP @PaulDBrant @jreedmp I DON'T CARE WHAT YOU SAID MR HANNAN. WE JUST VOTED TO STOP MASS IMMIGRATION. NOW DELIVER FOR US. Boris Johnson, a leading Leave campaigner and frontrunner to be next prime minister, wrote on Sunday that British citizens will still have access to the EU single market. "British people will still be able to go and work in the EU; to live; to travel; to study; to buy homes; and to settle down," he wrote for the Telegraph. The problem, of course, is that such continued freedom of movement for Brits will require freedom of movement for Europeans. The U.K. government and just about every independent forecaster, including the International Monetary Fund, said that a vote for Brexit would trigger financial and economic turmoil. Those warnings were dubbed "Project Fear" by Brexiteers, who said the U.K. would thrive outside the EU. Consider this: Since the results of the vote became known early Friday, the pound has crashed 12% against the U.S. dollar to its lowest level in decades, U.K. bank stocks have collapsed, and growth forecasts for the British economy have been slashed. Companies are putting investments on hold, and warning of lower profits. Chancellor of the Exchequer George Osborne said Monday the economy and government finances will suffer, but an emergency budget won't happen until a new prime minister is chosen in October. Business says it can't wait that long. Banks are already thinking about moving staff out of London. "What we need is a plan," said CBI Director-General Carolyn Fairbairn. "The government must act with urgency to minimize the uncertainties that affect investment decisions and slow job creation." Analysts say the contrast between promises and results will cause huge headaches for the new prime minister. "He (or she) won't be able to deliver the Brexiteers' promises of saving £350 million by leaving the EU, enjoying favorable trade agreements, 'taking control' of immigration while avoiding any significant economic setback at the same time," wrote Holger Schmieding at Berenberg bank.